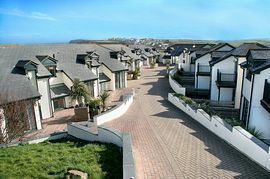 Welcome to Glendorgal resort and spa, a refreshingly different resort set in 17 acres of private headland overlooking the tumbling waves of the Atlantic and the beautiful North Cornish coastline. 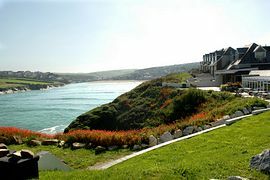 With its own private beach area, Glendorgal fulfils every dream of the perfect Cornish holiday. A selection of self-catering lodges and apartments are available for both families or couples who fancy a taste of life by the sea. All lodges have private balconies and decked dining areas while some have stunning sea views too. 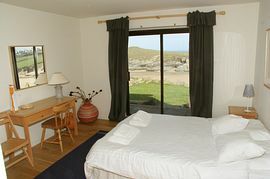 All self-catering lodges are decorated in Glendorgal's chic and charming beach style with comfortable, stylish interiors, our lodges may vary slightly in layout but all have a comfortable lounge area, a kitchen and dining area and a choice of 2 bedroom and 3 bedroom lodges sleeping between 4 to 6 people. Within the Glendorgal resort we also offer the Watermark Brasserie and Bar, renowned for its delicios sea-food dishes and modern cuisine. The Brasserie is open both for breakfasts and for evening meals and the Bar is available all day for the service of drinks. The views from the Brasserie conservatory are spectacular so it is well worth spending an evening here watching the stunning serenity of Porth Bay at dusk. 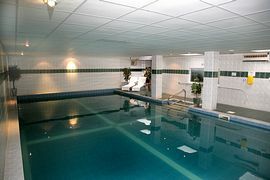 Also the Glendorgal is home to Newquay's premier health club and fitness arena and is jam-packed with pampering pleasures including a swimming pool, jacuzzi and steam room. Tranquility spa's fully qualified beauticians and masseurs offer a variety of exclusive treatments and therapies for all-over stimutlation and holistic well-being. There is a reduced daily charge for using the Health Club facilities and the pool is open for children between 2.00pm - 4.00pm daily. 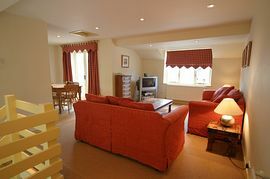 Overall, staying at Glendorgal gives a real nostalgic feel of rustic Cornwall come cool, modern chic. Overlooking Porth bay in 17 acres of headland. Watermark Brasserie and Bar and a Health Club on site. Dogs allowed in some houses and apartments (must be advised at time of booking in order that we can check availability of these). Newquay Zoo, Lusty Glaze Activity Centre, Waterworld, Blue Reef Aquarium, Dairyland, Horse riding, Eden Project and many more. We are 10 minute drive from Newquay airport. We are a 5 miinute taxi ride from Newquay train station. From the A30l turn right on the A392 towards Newquay. At the second roundabout turn right onto the A3058 to Newquay / Porth. At the next mini-roundabout go straight ahead (do not turn right to Porth). Passing shops on the left, turn right into Lusty Glaze Road. Follow signs for glendorgal and Watermark Brasserie and Bar. Prices from £525.00 to £1,890.00 per week.